Standard on the EX and above, the Magic Slide 2nd-Row Seats take the Odyssey’s seating capacity from 7 to 8. Handy for Inglewood’s busy streets, the multi-angle rearview camera displays a live feed of the area behind the Odyssey. Travel in comfort with the standard 8-way power-adjustable driver’s seat, which can be had with optional two-position memory settings. Standard on Touring and Elite, the built-in HondaVAC lets you pick up dirt, pet hair, or remnants of the kids’ snacks with ease. Available tri-zone automatic climate control—keeps the cabin cool in the Santa Monica heat. Standard push button start—lets you load up the seats and cargo area, press a button, and go. Available CabinTalk In-Car PA System—lets you communicate with your passengers without having to raise your voice. 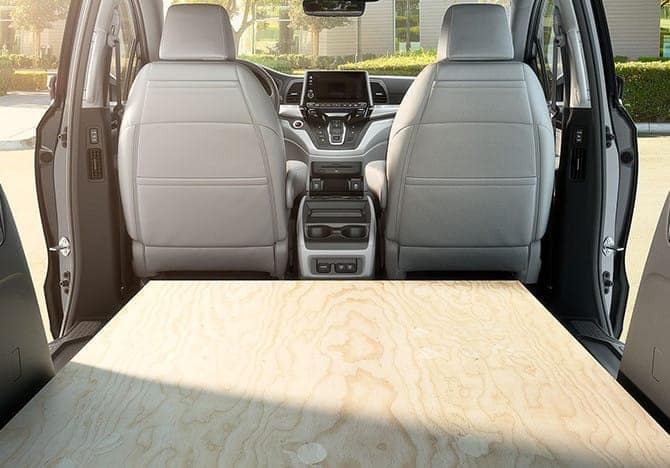 The 2018 Honda Odyssey interior offers room for the whole family and their belongings. With the third-row seats up, the Odyssey delivers up to 38.6 cubic feet of storage space. Need extra room for furniture or luggage? Fold the second- and third-row seats down for up to 158 cubic feet of cargo room. To load or unload cargo, simply push a button to open/close the height-adjustable power tailgate.